Kangasala is a municipality in Finland, next to Tampere. It was founded in 1865. 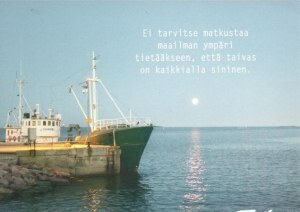 It is famous for its natural beauty, as depicted by Zacharias Topelius in his poem Kesäpäivä Kangasalla (made into a song byGabriel Linsén). It is also known for its mansions, such as Liuksiala where Swedish queen Karin Månsdotter lived, and Wääksy. Kangasala has a long history of tourism.